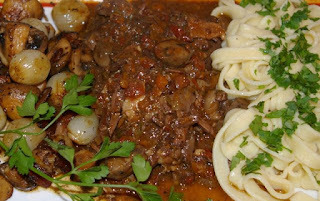 The Cook's Corner Blog: Boeuf Bourguignon Slow Cooker Recipe: This Is It! In this earlier post, I promised you that I would keep looking for a good recipe for preparing beef bourguignon in the slow cooker. Well, hang on to your hats, because I have found it! And I have tested it, and it's fabulous! It's as good as the Julia Child recipe, and that's saying a lot. So I gave it its own section on my Beef Bourguignon blog. Hey- Just wanted to say a huge thanks for this recipe. It is AMAZING. I'm glad you enjoyed it -- makes owning a slow cooker worth it, doesn't it? As for quantities, did you originally do this in metric or English? You call from 1-1.25 cups of wine but then say that this is 625 mL, which is more like 2-2.5 cups. Should I use the metric quantities or the English ones? Thanks! Hi Dave, As mentioned, I got the recipe from cookscountry.com, so the English measurement is the right one. You can also tell by reading the recipe: first it calls for 3/4 cup, then an additional 1/2 cup, for a total of 1-1/4 cups. Do try it, you'll be glad you did! "I am so happу Ι found your blog pagе, ӏ really found уou by mistake, while Ӏ was researсhing on Yahoo for something else. Anywaуs I am here now and would just like to say thanks a lot for a remarkable post and all round intеreѕtіng blοg (I also love the thеme/design), I don’t have time to look over it all at the moment but I haѵe bookmarkeԁ it аnd alѕo included youг RSS feeds, so when I have time I will bе back to read a lot more, Please do keep up the fantastic work." please note that I cannot accept it with that broken link to your website, so if you would like to resubmit it, maybe with a name instead of "anonymous", I will post it properly.